The sun rises from the east, cresting over the peaks of Salt Spring Island to bring light to the little village of Chemainus, nestled along the shores of the Salish Sea. Backing onto the foot of Mount Brenton, the Oceanside community resides at the northern reaches of the Cowichan Valley. The community of Chemainus derives its name from the powerful Chief of the Coast Salish Stz’uminus people, “Tsa-meeun-is”. On the site that is now known as “Old Town”, First Nations established a fishing settlement. In time, this bountiful region would, like so many others on the Island, draw early European settlers coming for timber, and officially become a town in 1858. Over the years, it’s suffered its share of highs and lows. Despite the pulp mill currently being one of the most modern and advanced on the Island, as well as the top employer in town, this wasn’t always the case. In the 1980s, brought on by a turbulent logging industry, the mill shut down. Not to be deterred by the economic downturn, the residents of Chemainus, led by a famous local artisan, piggybacked on a provincial government initiative to revitalize dwindling downtowns. 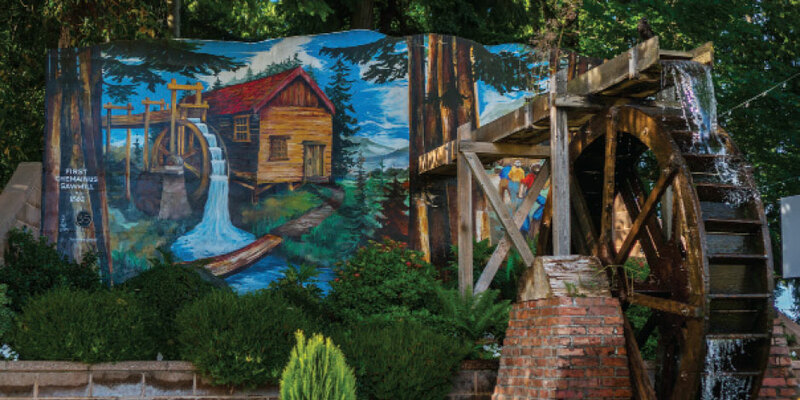 This led to the creation of the Chemainus Festival of Murals Society and the now world famous murals that feature over 40 mural and sculpture installations throughout the community. Entrepreneurs saw the rise in tourism, thanks to the murals, and opened boutique shops, wonderful cafes, and charming B&Bs. Artisans, in part inspired by the murals, migrated to the region, fostering a vibrant arts and culture community featuring several art galleries. The Chemainus Theatre Festival is now celebrating its 25th amazing year of operation and according to their website, put on over 300 shows a year, which draws more than 70,000 visitors to town. Chemainus would become know as the “The Little Town That Did”. Here you will find a bustling, active community that provides a unique visitor experience. Along with the forerunners, a wave of new residents has brought with it a zest for life, enthusiasm, and entrepreneurial spirit. Riot Brewing is a prime example. After one year, it’s now running at full speed and is one of the must-visit new craft breweries on Vancouver Island, given their Pilsner’s silver medal win at the Canadian Craft Beer Awards. Sawmill Taphouse has been making visitors happy for nearly two years with their full selection of beer on tap and incredible wood-fired pizza oven. Beyond The Usual continues to bring in footwear and apparel that fills the niche of the active life Vancouver Island is known for, and is about to celebrate its 3rd year in business. Start your visit downtown in the newly improved Waterwheel Park, which has become the epicenter of the community. Plan your day’s activities at the brand new Visitor Centre and Museum. Walk the murals in Old Town and New Town taking the opportunity to pop in and visit the many shops and interesting boutiques where owners will welcome you in like old friends. Come with a big appetite as the cafés, candy stores, and ice cream shops will be sure to delight and surprise. One such favourite is Hansel and Gretel’s Candy Company, that has visitors traveling from far away places just for their unique selection and beautifully decorated building. Stroll down Willow Street and you will find the Owl’s Nest Bistro, which probably has the best Salmon Eggs Benny on the Island. Across the way is Willow Street Cafe that has served customers for well over 20 years in one of the oldest, most beautiful heritage buildings in town. For those looking for something unique, Magpies Antiques and Gifts offers one of the finest curated vintage and antique collections on the South Island. If hard-to-find gifts are the mission of the day, then Bound to be Different is a name to remember. Fine art, pottery, carvings, and all manner of artisanal flair from over 50 of the Cowichan Valley’s finest artists, can be found at the Rainforest Arts gallery. Outdoor adventures here are sure to delight. Kin Beach is a beautiful spot with picnic tables, a playground, boat launch, and even a sunken Boeing 737 that creates an artificial reef for curious divers. Hiking the trails in Askew Creek Park, Echo Heights or the Hermit Trail let you walk amongst giant red cedars and Douglas fir. For sporting types, the beautiful Mount Brenton Golf Course is open year round. Chemainus Lake offers well-stocked fishing from a community dock and is surrounded by a 2.5km loop trail perfect for cycling or walks with the family. My love of this small community is strong and I could go on and on, but watch for the billboards that point down to our lovely community, and come see for yourself.